G5® massage machines have been sold and used successfully for over 50 years. They provide very deep penetrating massage using frequencies from 15 to 60 CPS. G5 massage machines are the only massagers with Directional Stroking®, not vibration. They are reliable, durable and quiet. Using G5 massage machines over a hot pack or cold pack seems to drive in the heat or cold. They can be equally-effective when used over toweling or clothing, and won’t tangle in hair. 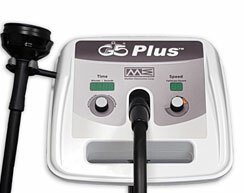 The G5 Plus is the newest massager in a long line of clinical models. It features a digital display that shows speed and time. Speed is adjustable from 15 to 60 cycles per second (CPS). The G5 Plus maintains its velocity, regardless of load. “Directional Stroking®” provides very deep penetration that can more effectively deliver hot or cold pack treatments. The G5Plus is ideal for physical therapy clinics and sports medicine. It helps in trigger point reduction, treatment of muscle spasm and pain relief. It’s a powerful and quiet machine, perfect for busy clinics. Assembled Unit Weight: 25 Lbs.